The Winslow Township resident and former NYPD officer suffers from illness attributed to the attacks. Chief George Smith of Winslow Township Police Department, Tyler Valentin, Harry Jr. Valentin, Georgina Valetin and Deputy Chief of the NYPD Patrick Conry honor Harry Valentin (center) for his service as a first responder in the World Trade Center on 9/11. Dust from the 9/11 attacks will never quite settle. It has, rather literally, lingered in the bodies of thousands who were amid the wreckage that catastrophic morning 16 years ago, especially affecting those running toward the rubble, as others ran away. 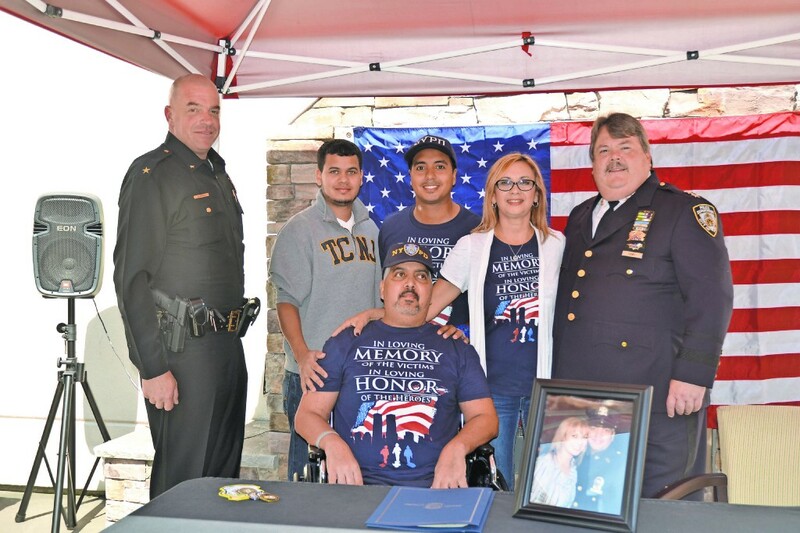 Harry Valentin, a 30-year veteran of the New York Police Department, was honored last Monday morning at PowerBack Rehabilitation in Voorhees for his service as a first responder in the World Trade Center attacks. Last month, the former detective first grade was admitted into PowerBack after being diagnosed with glioblastoma multiforme in February. Complications from the cancer have left him wheelchair-bound. The rare and aggressive brain tumor is directly related to his exposure to the toxins tainting Ground Zero, according to speakers at the ceremony. Dozens of servicemen and women gathered on the rehab’s second-floor patio to pay tribute to Valentin, including the county’s SRT team, the deputy chief of the NYPD, as well as officers representing Voorhees, Cherry Hill, Pine Hill, Waterford, Berlin Borough, Berlin Township and Winslow Township. Of the entire NYPD force, detectives have been most severely affected by post-9/11 cancerous illnesses, because they spent the most time in the shadows of the chaos, investigating morgues, landfills and Ground Zero, according to Paul Digiacomo, vice president of the Detective’s Endowment Association. On the morning of the attacks, the current Winslow Township resident was on duty with the Counter Terrorism Unit. Valentin was a mere three blocks away from the Twin Towers when they were attacked. Both Valentin and his wife, Georgina, were officially commended through township proclamations. Georgina, who was working with the Brooklyn North Homicide Detective’s Bureau at the time, was off-duty that day but naturally served as the events unfolded, immediately helping families of those affected. A 23-year veteran of the force, she met Harry while they were both with the NYPD. The couple has vigorously safeguarded not only the community but one another. “I don’t think Harry could have asked for anyone better to spend his life with. You are now, and always have been, Harry’s best medicine,” Conry said. Through his three surgeries and progress at PowerBack, Georgina and their three sons, Tyler, Harry Jr. and Franklin, have not left Harry’s side. Having carried each other through the grim tragedies of Sept. 11 , the couple has no intention of ceasing their resilience.